Do you know the muffin man … the muffin man … the muffin man? Well, if you mean the one who lives on Drury Lane … Yes, I know the muffin man! I am dating myself now, quite certainly, by recalling this childhood song. I doubt any millennials can sing it, or have ever heard of it. But one thing I do know is that I love English muffins. Doesn’t everyone? Splitting an English muffin in half, toasting it and spreading it softened butter and jam has to be one of the best breakfasts I know of … although they weren’t originally intended to be eaten that way. In America we think of ‘muffins’ s as small hearty, cake-like breakfast items, which may or may not be made with fruit and nuts. These are not to be confused with English muffins, which we sometimes call “crumpets”. Although both did originate in England and both are griddle cakes, technically, a “crumpet” is a bread-like dough using baking powder as its leavening agent, while “muffins” use the same bread-like dough but with yeast as its leavening agent. Also, crumpets are meant to be eaten without slicing open … muffins are sliced open. Confusing, I know. If you’ve watched Downton Abbey, or Upstairs Downstairs, you know that all wealthy aristocratic families had their own kitchen staff which, depending upon the size of the household, included cooks and bakers. The “muffin” or “crumpet” originated from the leftover dough the bakers would be baking that day. He or she would take the leftover bits, roll them up into a ball, flatten them and toss them onto a hot griddle. These would then be enjoyed by the “downstairs” staff at tea time. These crusty morsels were such a tasty hit, the “upstairs” family wanted them too. It wasn’t long before these bready treats were also being served “upstairs” at tea time. The word quickly spread about these delicious, small, round grilled rolls. And soon bakers everywhere were making them and peddling them on the streets to the working classes. At that time it was far too dangerous for city homes and apartments to have an indoor working oven. As a result most people could not do their own baking. So this inexpensive bread roll became an easy breakfast to grab and go while on the way to work. Early in the morning, on the streets of London, with a wooden board balanced on his head and a bell in hand, the “muffin man” would walk up and down the “lanes” ringing his bell to signal his arrival. And now that we know who the muffin man was, let’s make some muffins! I’m using British bread baker, Paul Hollywood’s recipe. Not quite sure how they are going to turn out, but let’s have fun trying. Makes 8 to 10 good-sized muffins. Prep time: about 2 to 3 hours. This makes a VERY wet, soft and sticky dough and can be tricky to handle. Should it get too sticky while kneading, let it rest for ten minutes. The gluten will relax and then go back to kneading. In a large mixing bowl with a paddle attachment (or by hand), mix all the dry ingredients together. You may want to dissolve the dry yeast in the warmed milk, or not. It’s up to you. If you dissolve the yeast in the warmed (not hot) milk, it will shorten the proving time a bit. Add the milk (yeast mixture), beaten egg and softened butter. Beat all the ingredients together until smooth, glossy and the dough has formed a ball. Turn the dough out onto a lightly floured board and let it rest for ten minutes. After ten minutes, begin kneading. It will be STICKY. Don’t add more flour or you will change the structure of the dough. Continue kneading (scraping the board if necessary) until the dough has stopped sticking and is smooth and shiny. This will take about 15 minutes. 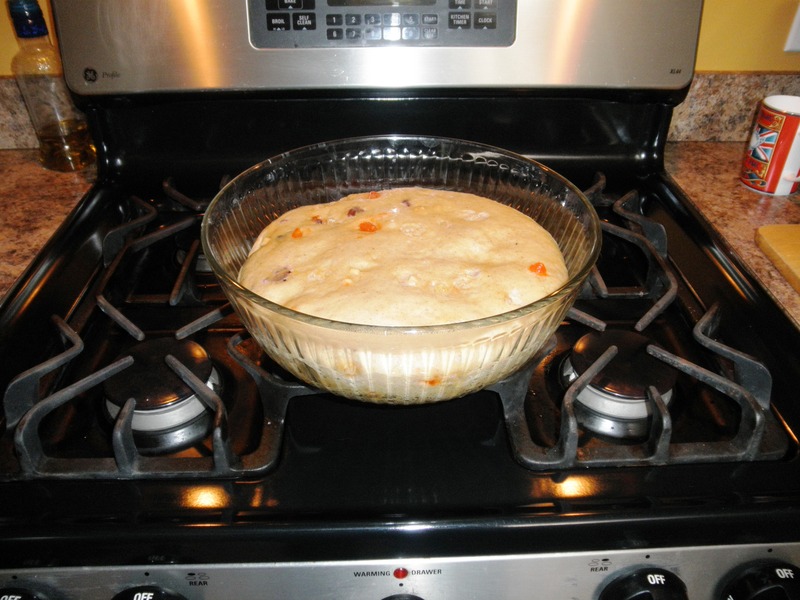 Place the dough into a lightly greased bowl, cover with plastic wrap and put it in a warm place to double in size. If you want to make the dough at night to cook in the morning, just place the dough into the refrigerator. This will slow down the proving process. When the dough has doubled in size, tip it out onto a lightly floured board which has been dusted with corn meal. 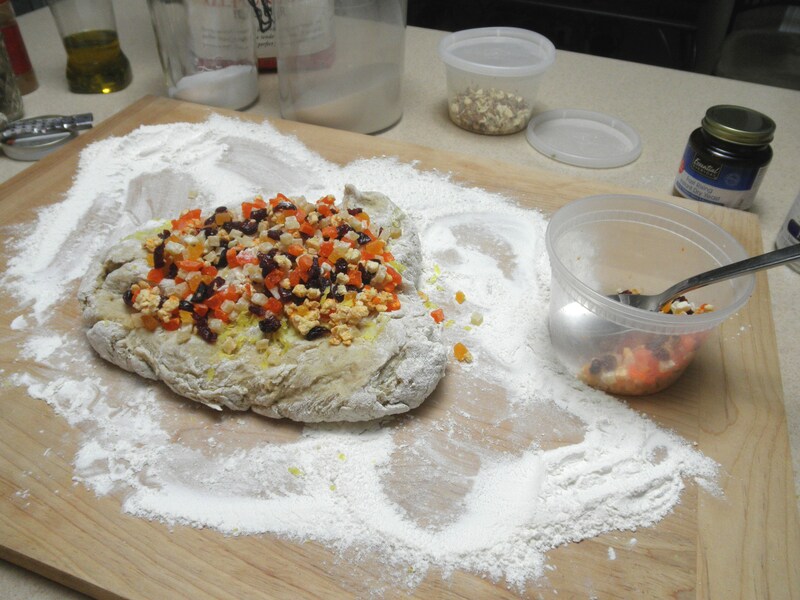 Roll the dough out like a pizza to about 1″ thick. Using a biscuit cutter, dusted with flour (or tuna fish can, which is what I use), cut out the ‘muffins’. You should get between 8 and 10. Place the muffins onto a parchment lined sheet which has also been dusted with corn meal. Cover the muffins lightly with plastic wrap and let them rest for about 30 minutes. Preheat a stove-top griddle over medium heat. Lightly oil the griddle. If you prefer to oven bake them, preheat the oven to 350° and use a heated pizza stone. When the griddle is ready, toss the biscuits onto the surface and cook them for about 10 minutes or more on each size, depending upon the thickness of the muffins. Baking will take about 25 minutes (flipping them over half way). When done, move them to a wire rack to cool. Then put the kettle on, get the butter and jam. Slice one open and lash on the goodness. You deserve it. Honestly, once I realized how to work with such a sticky dough, they were quite easy. Now they are going to be a weekly treat … perfect for a weekend breakfast. My most favorite holiday of all, Thanksgiving, is almost here. I’m not really sure why, perhaps because its just about family and tradition. Christmas comes in at a close second, but Christmas can be stressful. Not Thanksgiving. And Thanksgiving occurs at the most beautiful time of year … cool, crisp Autumn weather, perfect for having an enormous feast. And, hopefully, you get to share this feast with people you truly care about. Even with all the work and chaos, I love it! This is one of the recipes I have been making for about (cough, cough) 45 years, which MUST appear on the Thanksgiving table. 45 years ago we didn’t have the Internet or celebrity chefs and cooking shows, we found recipes wherever we could. I found this recipe on the back of the bag of Ocean Spray cranberries. I cut it out, taped it to a 3 x 5 card and put it into the recipe box, where it’s been ever since. Although I’ve tweaked it just a bit over years, it’s basically the same. Preheat oven to 350°. Grease a 1 lb. loaf pan, bundt pan, or muffin tins. I chop the cranberries in the blender. You can use whatever way to chop the cranberries that is easiest for you. For the nuts, I just use a knife to chop. Otherwise they become too fine and I like them chunky. Add the wet ingredients to the dry ingredients and mix well. Don’t overbeat or the bread will become heavy. Stir in the cranberries and then add the nuts. Pour the batter into a well greased pan (or pans). I think a bundt pan makes a nice presentation. This will make one large loaf, or many smaller ones or muffins. Bake for one hour (depending upon the size of the pan – muffins bake for about 25 mins.) or until toothpick inserted into center comes out dry and clean. The bread should just pull back from the outside of the pan. Cool on a rack for 10 minutes and then cool completely before slicing. This quick bread freezes beautifully, so if you want to make it ahead, do it with confidence. Otherwise, find a plate, dust with powdered sugar and garnish. To be enjoyed with your Thanksgiving dinner, or for Thanksgiving breakfast, or even later in the evening with your cuppa, enjoy! Pumpkin-flavored anything has taken over the country! I don’t know who started it (or why) maybe it was the competition between Dunkin Donuts and Starbucks with their Pumpkin spiced lattes, but the “pumpkin” craze is crazy!! Forget about cookies, pie and cheesecake, now it’s all about pumpkin flavored cereals … and truffles … and ice cream …. not to mention yogurt, potato chips and now pumpkin-spiced “Peeps”. Yikes! We’ve gone pumpkin mad! I’d love to bring our love for pumpkin back down to earth, so I’m sharing my recipe for Pumpkin Scones with Pumpkin Butter. Moist, delicious and full of that pumpkiny flavor we all apparently love. But, please note, these are not the dry flavorless scones you find in coffee shops. 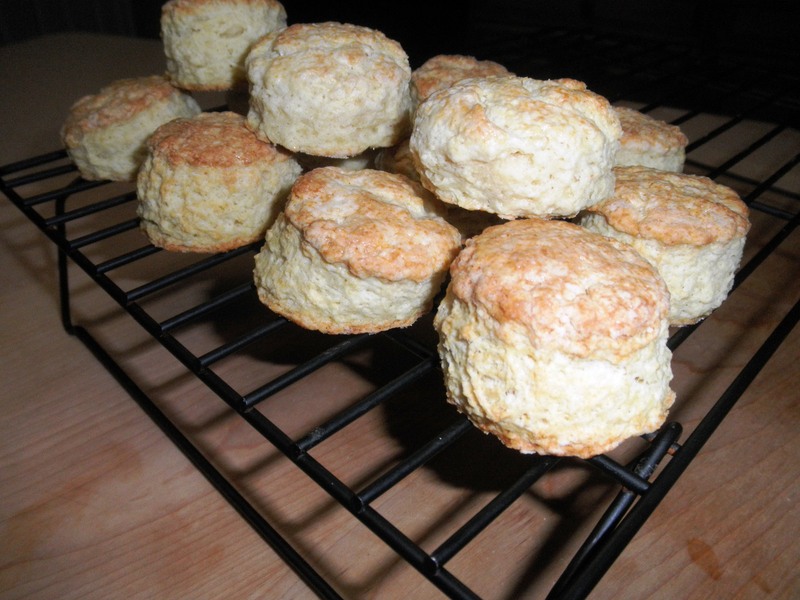 These are British-inspired scones, moist and biscuit like. Hot out of the oven, break them open and slather on a good amount of this not overly sweet pumpkin butter. Enjoy! Assemble all your ingredients and baking tools – but do not preheat the oven at this time. Line a baking sheet with parchment paper. Do not preheat the oven as yet. If you are using fresh pumpkin, you’ll need about 2 cups. Canned pumpkin can have a lot of moisture, so be sure to drain the pumpkin before using. I use a food processor. It’s just the easiest and quickest way to cut the butter into the dry ingredients. While the pumpkin is draining, add the all dry ingredients (flour, baking powder, soda, spices, salt and brown sugar) into the food processor and pulse to blend well. 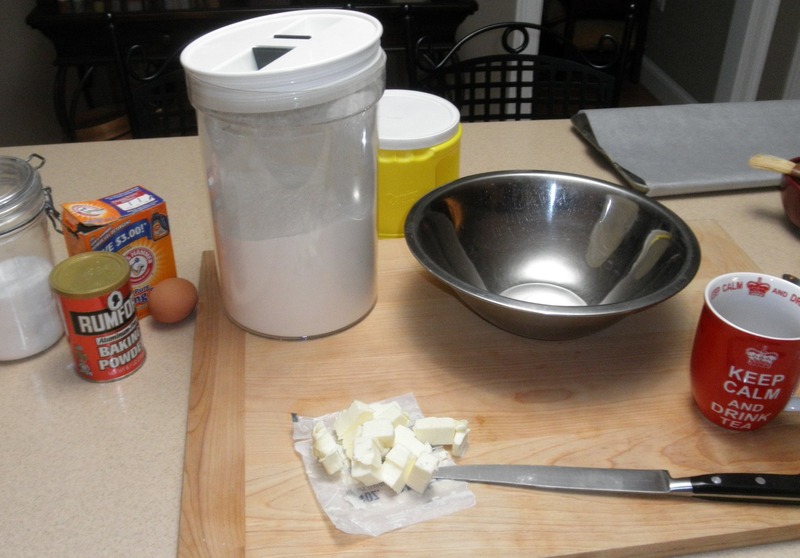 Cut the COLD butter into 1/2″ cubes and add to the flour mixture. Pulse quickly just to combine. Do not overmix the dry ingredients. Bits of butter should still be visible in the flour. In a large separate bowl mix together the drained pumpkin and the buttermilk. Put all the dry from the food processor into a large bowl, adding the nuts, and then, with a fork, stir in the pumpkin mixture. Work quickly mixing all the ingredients together until just blended. Do not overwork the dough or our scones will be heavy and tough. Dump the batter onto a lightly floured board. Knead lightly until smooth and form into a round or square shape. Then roll to a thickness about 3/4″ high and approximately 8″ in diameter. The shape will depend upon how you want to cut them. The batter should still be soft and sticky. 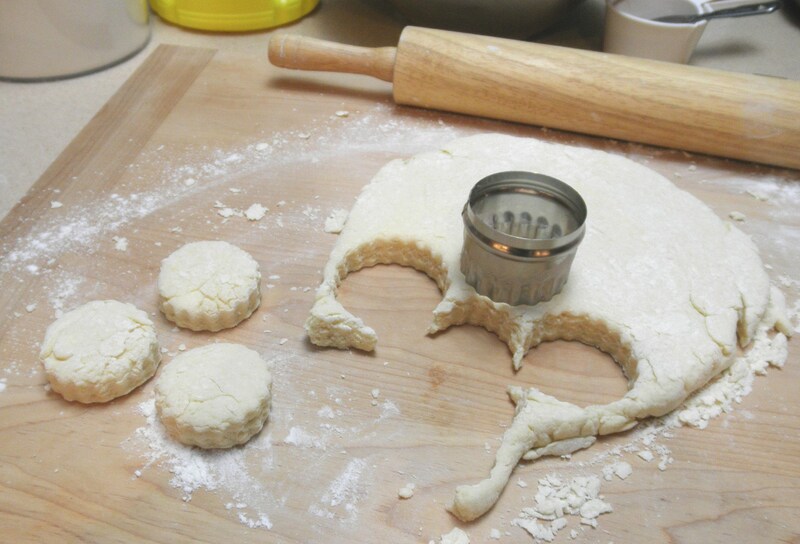 By dipping the biscuit cutter or knife into flour after every cut, you avoid squishing the dough together. Try to make clean cuts, not twisting or turning the dough. Whether you cut the scones into rounds or triangles or squares is all up to you! If you have any scraps after cutting, reform the dough and continue making more. Transfer the cut pieces onto a parchment lined baking sheet by again dipping a spatula into flour and lifting from underneath. Try not to compress the dough or add too much pressure. Arrange the scones on the baking sheet about 1/2″ apart. They will rise while baking. Brush the tops of the scones lightly with melted butter and sprinkle with brown sugar. Then place the baking sheet into the refrigerator for at least 30 minutes (or more). Only then should you preheat the oven to 425°. Bake for approximately 20 to 25 minutes (rotating the tray about halfway through the bake time), or until a toothpick inserted into the middle comes out clean. The scones should be puffed up, lightly browned on top and on the bottom. Transfer the scones to a wire rack to cool. Serve warm or cool. It’s entirely up to you! For breakfast or tea, if you and your family love pumpkin, I hope you LOVE these moist, rich and delicious (not overly sweet) scones. In Wales, as in so many countries, it was customary for the women of the household to designate one day as “baking day”. The entire day would be spent making all the breads, rolls, cakes and biscuits that would be needed for the week. Using any bread dough that was leftover from making the yeast breads would then become the base for this bread. Adding leftover tea, spices, dried fruits, sugar would then become that family’s Bara Brith. 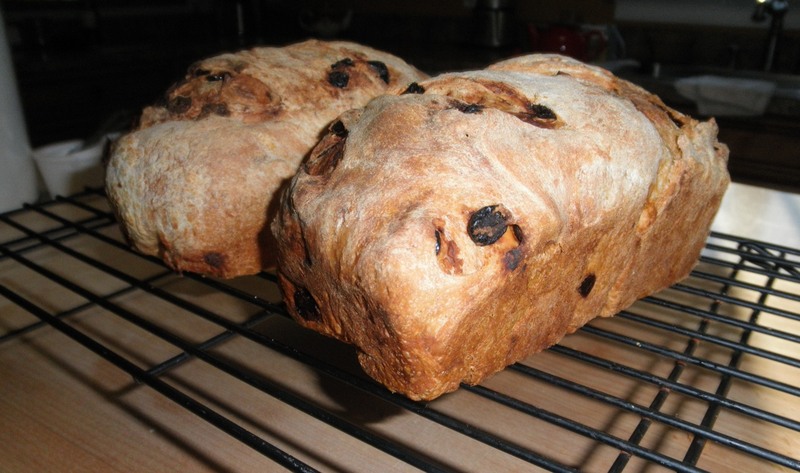 Bara Brith or in Welsh “Speckled Bread” is exactly what it is … a bread speckled with dried fruits. 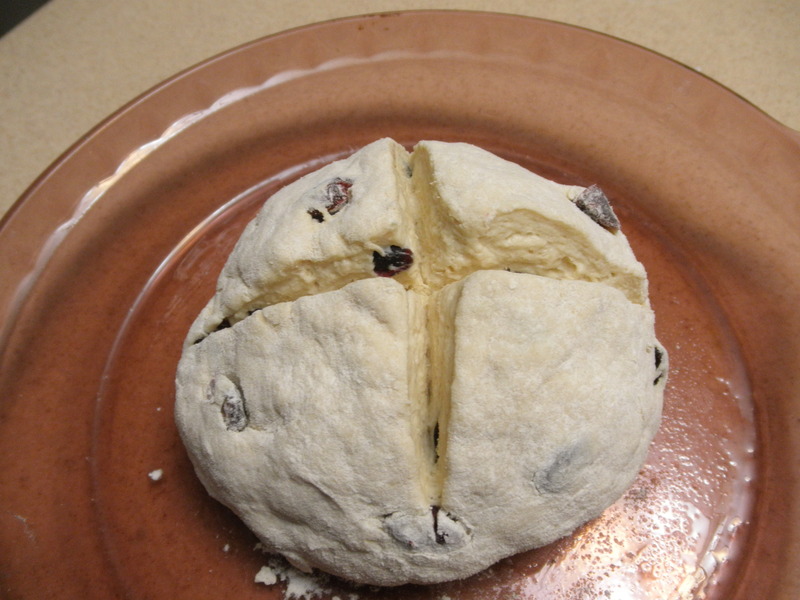 Traditionally this is a yeast bread, but it is quite often made as a quick bread. As with any regional recipe, each family has their own version. This one might be a bit different from some that you’ve had in the past, why? because it’s MY version …. and it is delicious!! If you are a fan of “the Great British Bake Off“, as I am, you might remember that one of the contestants actually baked her version of a yeasted Bara Brith as her entry on Season 4. Click on the link below and you’ll find her recipe. My version is a quick bread … but keep in mind you do have to let the dried fruits soak in the hot tea for a couple of hours in advance. Bake 350°F for approximately one hour. Makes one large loaf. In a bowl, mix together the dried dates and dried raisins (or any combination of diced, dried fruits). Pour one cup of hot, strong black tea over the fruits. Cover and then let them plump up for at least three to four hours (or overnight, if you’d like). Grease a one pound loaf pan. Sift together the dry ingredients. I love the flavor of almonds, and the texture that it gives this bread. Use ground almond meal if you have it, or omit it and increase the flour to 2 cups. This is all up to YOU. Peel and grate on e cooking apple (not a Mac or Macoun – too juicy). In a large mixing bowl add all the dry ingredients, the brown sugar, the egg, the melted butter, and the dried fruit/tea mixture (with all the tea liquid). Beat together until well blended. Pour the batter into the prepared pan and bake for one hour. Test after about 50 minutes for doneness. When done, turn out onto a cooling rack and then put the kettle on. This bread is so-o-o-o moist and delicious, you’ll have a hard time not eating the entire loaf yourself! The first time I had Barm Brack was in Ireland about 35 years ago when it was served to me with breakfast … warm from the oven, rich and dark, speckled with dried fruits and slathered in sweet, creamy butter. Barm Brack is not a bread you see here in the U.S. unless you go to a bakery which specializes in Irish foods. So I was determined to make my own. The problem is, there appears to be as many different recipes for this classic Irish loaf as their are dried fruits in the mix. The name Barm Brack comes from the English word, “beorma,” which means yeasty and the Irish word “brac” which means speckled. So we have a yeasty bread with dried fruits. There is a quick bread version which uses baking powder and dried fruits called “Tea Brack”. Most recipes talk about how Barm Brack is traditionally served at Halloween with small trinkets concealed in the bake … much like the baby in the King Cake at Mardi Gras. 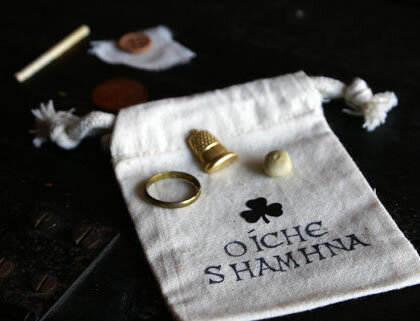 On Etsy you can actually buy Barm Brack kits to add the charms to your dough – a coin (for riches), a ring (for marriage), a pea (for no marriage – or maybe divorce), and a stick (for an unhappy marriage). I think I’ll pass on adding these things to my bread. Makes one large round loaf or two smaller ones. Preheat oven to 350°. Into a large mixing bowl add flour, salt, allspice and blend together. In a separate bowl mix together the sugar, yeast and warmed milk (not too hot). Make a well in the center of the large bowl and pour in the yeast mixture, melted butter and most of the warm water, including the dried fruits. Using a dough hook (or wooden spoon if you are not using a stand mixer), blend all ingredients together until incorporated. Add more water if needed to make a smooth dough. Turn out onto a lightly floured board. 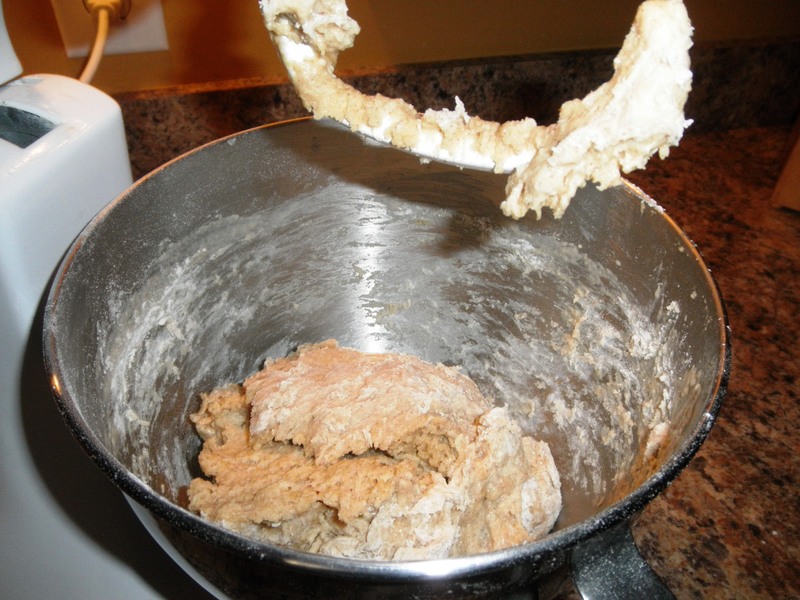 Let the dough rest for a few minute while you wash out the bowl and oil it. Knead the dough vigorously for about 10 minutes until smooth and no longer sticky. Place the dough back into the bowl, oil the top of the dough so it doesn’t dry out and cover with plastic wrap. Pla ce the bowl in a warm spot, free from drafts, to let the dough rise until its about double in size (one to two hours). When the dough has risen, it should retain an indentation when you press into it with your finger. Punch the air out of the dough and turn it out onto a lightly floured board once again. Prepare your pan(s). The classic shape is one large round loaf. I’ve chosen to use two one pound loaf pans. Shape the dough, making sure there are no air holes and place it into the pan. Let rise again until doubled in size (about one hour). Brush the tops with melted butter. Make slits in the top of the loaf if you’d like. Bake at 350 for 1-1/4 hours if one loaf, or 60 minutes for two. The loaf should sound hollow when rapped on the bottom with a spoon. Turn out onto a wire rack and let cool. Take the butter out of the frig and let it get nice and soft. Then put the kettle on, make your tea and enjoy! The Lemon Curd is in the refrigerator chilling and now I’m ready to make the scones. Today, I’m in the mood for a classic English scone. Nothing fancy. No lavender honey scones. No chocolate chips and hazelnuts. Not even currants. Just flaky, buttery, warm from-the-oven scones. You can get creative if you want to (and I’ll even give you some suggestions at the end), but for me, it’s the basic. Classic English Scones are not the dry, triangular-shaped muffiny things you find in a lot of coffee shops. They are more like the American biscuit so common in the South – but made with butter and not shortening. It takes a light hand. You do not want to overwork the dough building up the gluten, making them tough. Some people prefer working the butter in with their hands. I prefer a food processor. Not only is it quicker, but the heat from your hands, makes the butter too soft and the scones are less likely to be flaky. Preheat the oven to 425°. Bake for 12 to 15 minutes (depending upon size). Makes 8 to 12 (again depending upon size). Preheat the oven and prepare the baking sheet. I prefer parchment paper to greasing a baking sheet. Combine all the dry ingredients. With a fork, pastry blender, or in a food processor, cut in the very cold cubed butter until the flour mixture is blended and about the size of a pea. (Yes, my cuppa tea is always around.) Do not overwork the dough. You should be able to see bits of butter. Make a well in the center of the bowl. 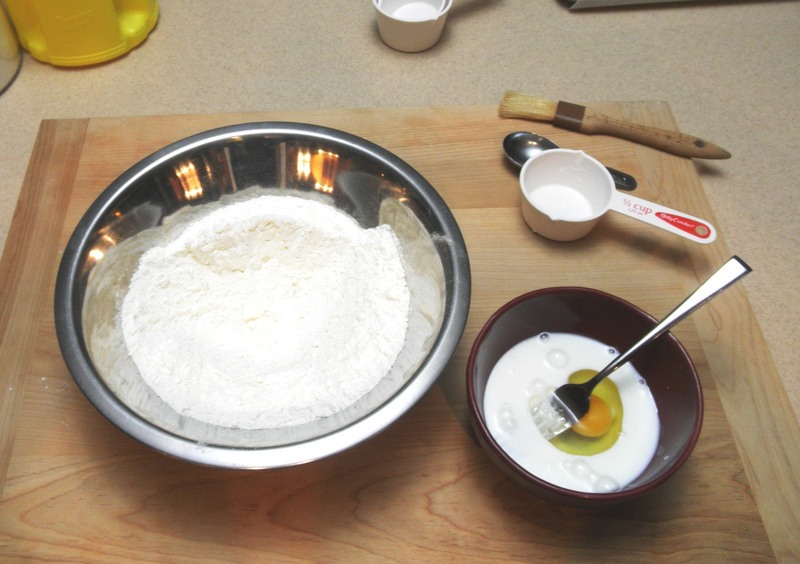 Mix the buttermilk and beaten egg and, with a fork, quickly mix the wet ingredients into the dry ingredients. Turn the dough out onto a floured board. Again, quickly form a round, smooth ball, after kneading a few times. Brush the tops with cream (or beaten egg white) and then sprinkle lightly with sugar. Bake at 425° in the center of the oven for 10 to 15 minutes, until the tops are lightly browned. Cool on a wire rack and then serve with the delicious lemon curd you prepared earlier (or strawberry jam, whipped cream, etc.). Don’t limit your imagination. Now it’s time to put the kettle on and enjoy!! 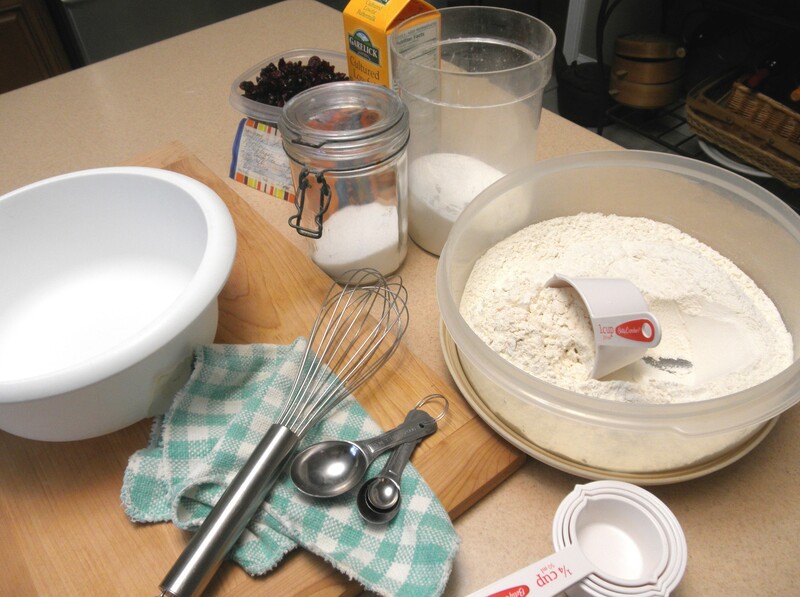 Optionial ingredients: You can add any combination of the following – dried currants, raisins, cranberries, blueberries, mini chocolate chips, mini white chocolate chips, chopped nuts, orange peel, vanilla, lemon peel, dried lavender buds. *To make savory scones, omit sugar. Add grated cheddar cheese, or chopped prosciutto, maybe fold in chutney, or herbs. Let your imagination run wild. Until yesterday I didn’t know what a ”courgette” was either! Now I do! It’s a ZUCCHINI. In Great Britain, a zucchini is called a “courgette“. Also there are “golden courgettes“, which we call summer squash. It seems this squash we call “zucchini” was originally from America, but somehow it found its way to Italy and then became introduced back to the States. So confusing! ‘Zucca’ is the Italian word for squash and ‘zucchino’ means ‘small squash’, which in the plural is ‘zucchini’. “Courgette” is French for squash, which is the name used for this vegetable in many parts of Europe. Well, my garden has been bursting with ‘courgettes‘ and I’ve made them every way I can think of … from sautes to stir fries to soups and stews, even pickling. (Yes, they are delicious pickled.) I’ve skewered them, roasted them, stuffed them, grated them and breaded them. 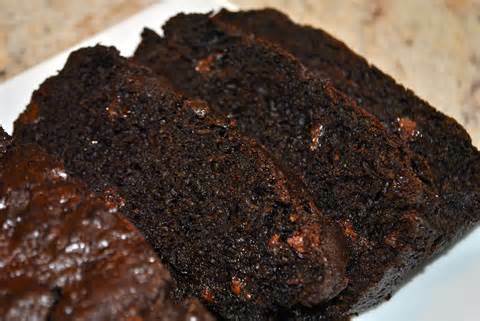 But, the best ‘courgette‘ recipe is this decadent, rich, chocolatey tea bread. Oh my, you will love it! The only time consuming part of this recipe is grating the zucchini. It couldn’t be easier. Preheat oven to 350°. Lightly grease and flour two loaf pans (or 24 muffin cups – or 1 bundt pan). In a large bowl beat together the wet ingredients and then fold in grated zucchini. When combined thoroughly, stir in dry ingredients. Mix well. Add chocolate bits and/or walnuts if desired (first coat with a little flour to keep from sinking into batter). For bread, bake for at least one hour or until toothpick inserted in center comes out clean. Less time for muffins. A bit more for bundt. Let cool completely before removing from pans. Then put on the kettle and enjoy a hearty cuppa with a large slice! I know what you’re saying, “hot cross buns?“. I grew up knowing that hot cross buns always appeared around Easter, and I certainly loved eating them, but I never knew their origin or why they were important to the Easter holiday. During Elizabethan times (16th century) the celebration of Easter was the most important feast day in Great Britain. Often referred to as the Golden Age, this was a time of relative calm. The country was experiencing greater wealth. Protestants and Catholics resolved their differences. Parliament and the Monarchy worked together. 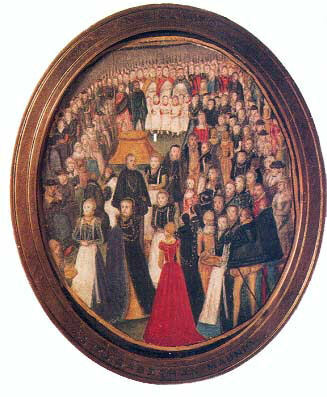 And Queen Elizabeth began an event during Holy Week, known as the Cambridge Fair, so that she could be ‘among the common people‘. The buns quickly became a tradition to be eaten for breakfast on Good Friday. Street sellers would be out before dawn selling these sweet, fruit-laden breads. According to legend, one bun would be saved until the following year to bring the family good luck! To bring your family good luck in the next year, go out and buy some Hot Cross Buns today. 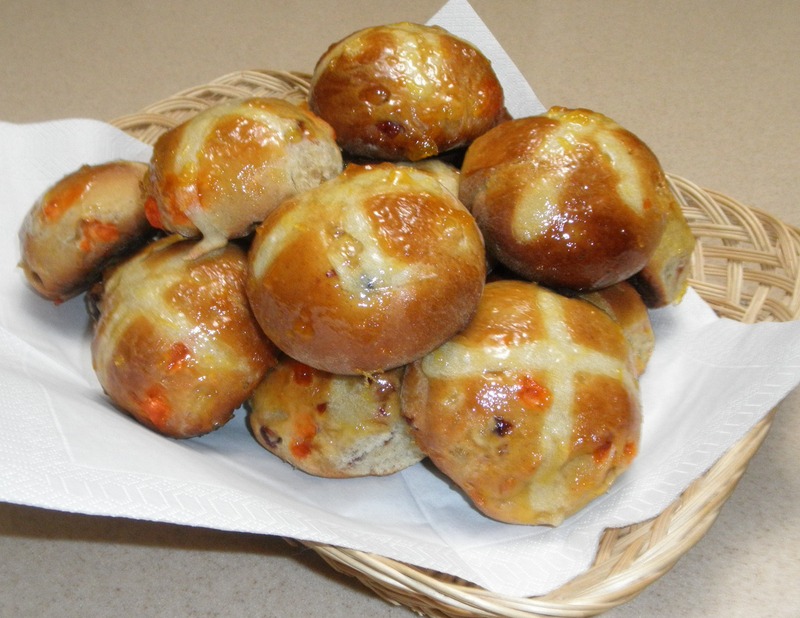 Or if you are daring enough to make these delicously rich buns, give the recipe a try …….. This is a three-step recipe and is perfect for a rainy day, when you can immerse yourself in the sights, smells and textures. Plan on 4 hours from start to finish. These are not the overly-sweet, icing rolls you find in U.S. stores. They are the classic Easter rolls, rich with a hint of cinnamony spice. Bakes at 350 degrees for 20 minutes. Makes 12 to 16. Warm the milk (a microwave oven is fine) and add the yeast. (I generally use canned milk for my bread baking. You can’t beat the convenience and it’s creamy and smooth.) Set aside to allow the yeast to proof (bubble up). In a large mixing bowl, add the flour, salt, sugar, cinnamon and nutmeg and mix well. When the yeast mixture is bubbly, add it to the dry ingredients with the melted butter, beaten eggs and water. Beat until all the ingredients are blended together well. The dough should be soft, but not soggy. Tip the dough out onto a floured board. 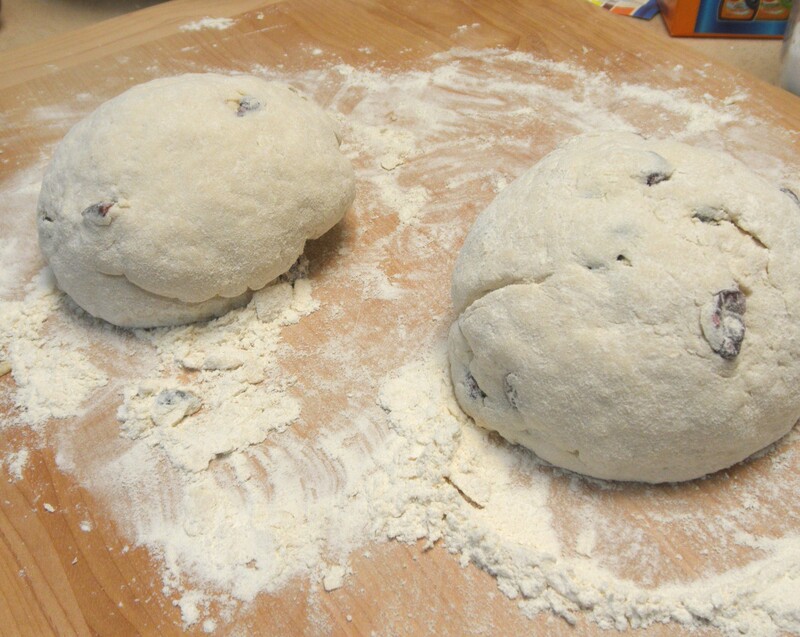 Sprinkle the mixed dried fruit over and then begin kneading. You want to knead the fruit into the dough and work the dough until it becomes soft, smooth and shiny. This should take about 5 to 7 minutes. When the dough feels smooth, put it into a large oiled bowl. Turn the dough over and over until it is oiled as well. Cover the bowl with a towel and leave to rise in a warm spot. The dough should rise until it has doubled in size – from one to two hours (longer is fine). After the dough has fully proofed, punch it down to knock out all the air, and tip it onto a floured board again. Meanwhile, warm your oven to 350° and line the baking sheets with parchment paper. Cut the dough into pieces (12, 14, 16 you decide how many you want to make and how big they should be). Flatten each piece and then tuck the sides under until you have smooth, uniform rolls. Place on the baking sheets, fairly close, but not touching. 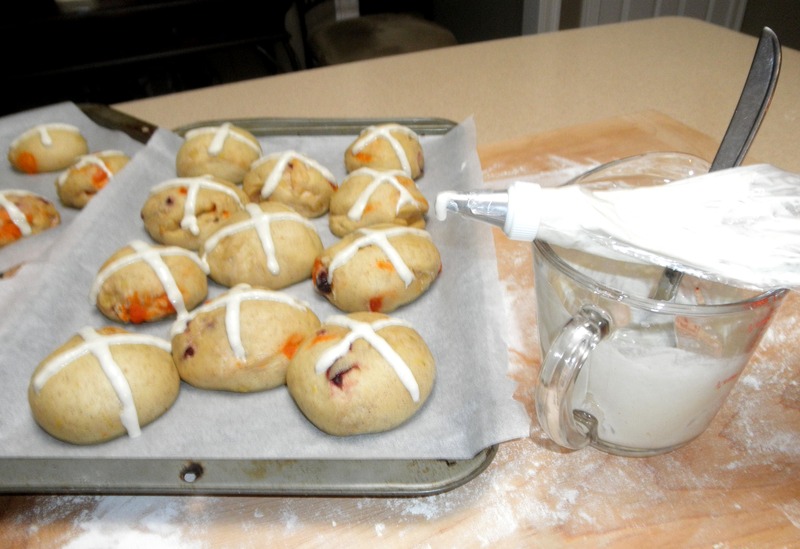 For the classic cross, mix 1/2 cup flour with 1/4 cup water til smooth. Put this paste into a piping bag (plastic bag will do fine) and pipe a cross on the top of each roll. Bake for 20 to 25 minutes until golden brown. When they come out of the oven, brush each roll with apricot jam (thin with a little water if necessary). The jam adds a nice sheen and sweetness. Cool on a wire rack. Enjoy! The last time I saw my Aunt Mae was in her bungalow in the village of Tullamore in County Offaly, Ireland. We spent the afternoon sitting at the kitchen table having tea and her freshly-baked soda bread while looking through the family photograph albums. She was a mere slip of a woman, barely 5′ tall, with a delightful sense of humor, ready to enthrall you with endless stories. 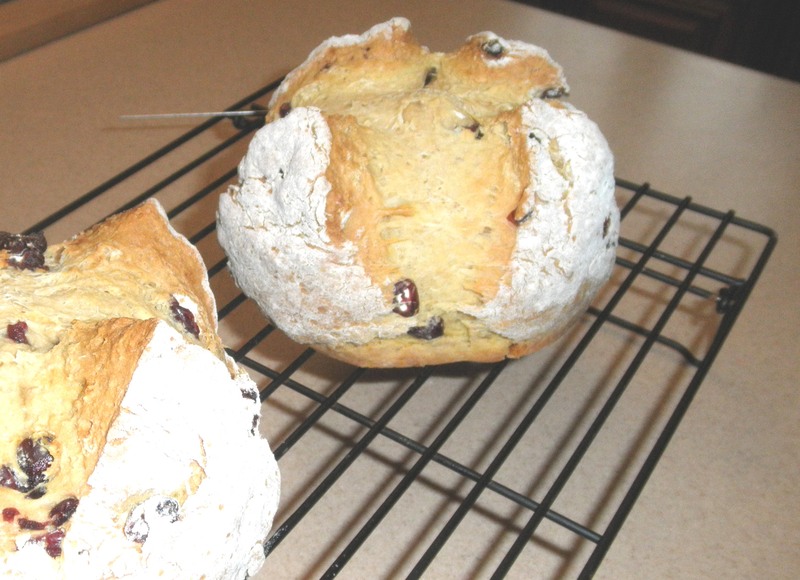 This may certainly be the same classic Irish Soda Bread recipe that everyone uses, but for me, it’s my Aunt Mae’s soda bread ….. and it’s delicious! Even if you aren’t someone who bakes, you can handle this one. It’s quick and easy. When you take it out of the oven, serve it up quickly with a big block of imported Irish butter. Nothing better! This will make one large loaf or two smaller loaves. Preheat the oven to 375 degrees. 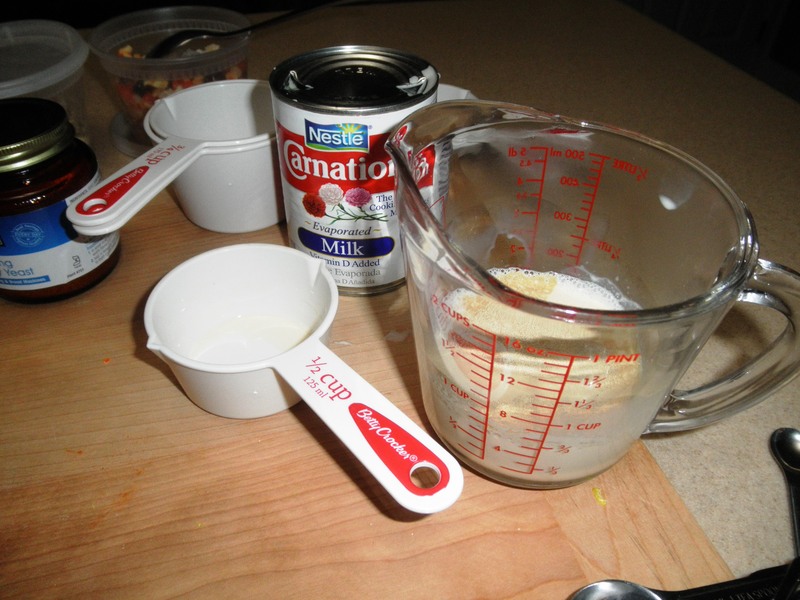 Gather the following ingredients, a large mixing bowl, measuring cup and spoon and baking pan or dish. That’s it! 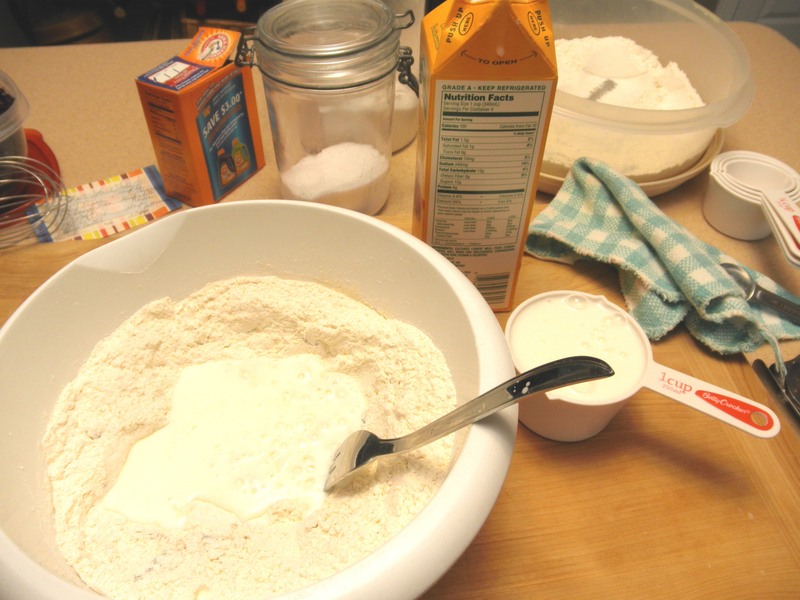 Put the flour, baking soda and salt in a mixing bowl and mix together. I use a whisk to incorporate the dry ingredients thoroughly and lighten the flour a bit. Add the dried fruit and mix together. Make a well in the center of the dry ingredients and pour in all the buttermilk. With a fork, stir quickly until the dough comes together. On a floured surface, tip the bowl over and work the dough with your hands into a nice smooth ball. Don’t overknead the dough. It will be soft. Form a ball (or two if you are making two loaves) and place it in a greased baking pan. Mine could have been a bit smoother. Cut a criss-cross slash into the top of the loaf, about 1/2″ deep. This will allow the loaf to cook evenly. It will expand (or open up) as it bakes. Bake for about 50 minutes to an hour. It should sound hollow when the bottom is thumped and a cake tester should come out clean (no crumbs). If you want to add a bit of sugar for sweetening, add it to the dry ingredients. You may also brush the top of the loaf before baking with an egg wash or milk for a shiny crust. 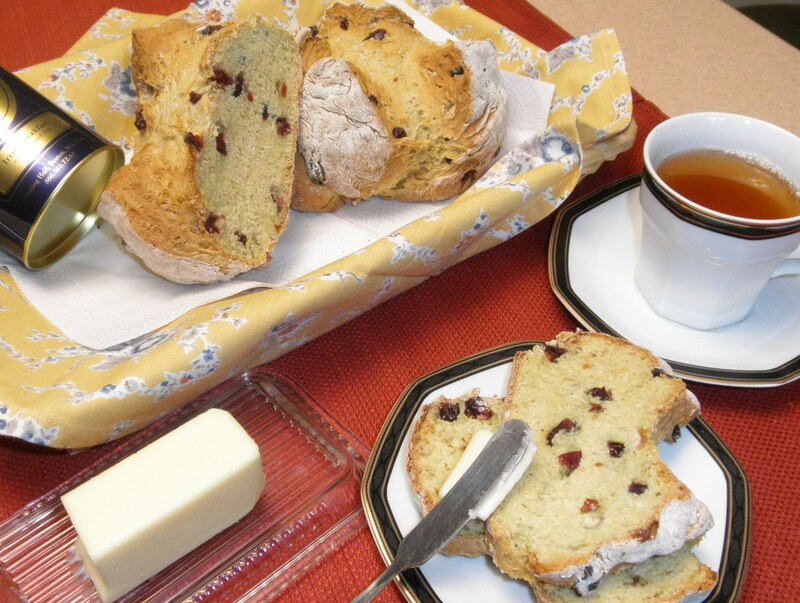 Be sure to put the kettle on, because you’re going to want a hot cuppa with a slice of Aunt Mae’s Soda Bread!